The shrivelled and distorted folios of the Great Parchment Book have earned it the nickname the “poppadom book”. 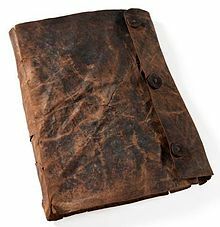 Imagine then the state of a parchment book which has been likened to lasagne or alphabet soup! This was the case with the Faddan More Psalter, also known as the Irish Bog Psalter, discovered when it was dug up by a mechanical digger in a bog at Faddan More, near Birr in County Tipperary, Ireland in 2006. The manuscript, an early medieval Christian psalter or text of the book of Psalms, was probably written in about 800 in one of a number of monasteries in the area. Following its discovery, it was retrieved by the Museum of Ireland and a complex conservation project ensued, with systematic recording and dismantling in order to extract as much information as possible about it as treatment proceeded. The project was overseen the National Museum of Ireland and Trinity College Library, with specialists in different aspects of the work sought for consultation as material related to their fields became available. The approach to treatment was very similar to that undertaken with the Great Parchment book with a thorough condition assessment followed by the testing of conservation techniques such as those used to dry out the folios in the case of the waterlogged Faddan More Psalter, and humidification and then drying with the Great Parchment Book. After several years of conservation work, the psalter went on display at the National Museum of Ireland in 2011. You can read more about the project on the Museum of Ireland’s web pages about the Faddan More Psalter.